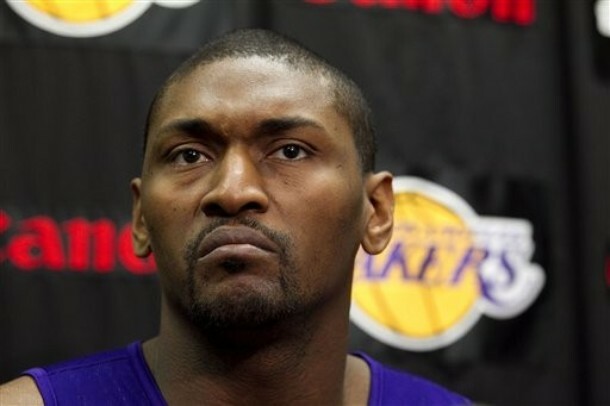 Metta World Peace a Vampire? The “Real Vampire Housewives” series follows a group of women who are married to vampires. The show focuses on the women’s devious exploits during the day, while their vampire husbands rest at night. Metta World Peace will play the vampire “Gossamer,” according to producer Robert A. Parada of Streetwise Entertainment. The independent series, which is slated to begin shooting this fall, is being co-produced with writer/director Andre Jetmir. “Robert mentioned Metta World Peace and it was yes in an instant. Metta is perfect as a vampire; he is physically intimidating in an Alpha-male way, very charming, a little mischievous and he has a raw sexuality I think most actors try to find when they play a vampire,” Jetmir said. This entry was posted in Gossip and tagged Los Angeles, Los Angeles Lakers, Metta World Peace. Bookmark the permalink.